Bills Opinion:MAY I MAKE A SUGGESTION? Sunday evening, February 4th, officials from Winzinger Construction Company gathered at the future Walgreen’s site at the Black Horse Pike and Kings Highway. The officials weren’t meeting to finalize plans or to pour concrete, the Winzinger crew was there to accomplish one objective; and that was to start demolishing the remaining Harwan Theatre and adjacent structures. 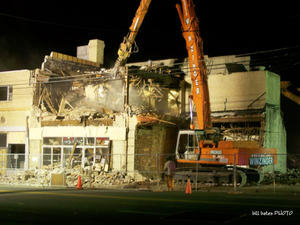 The demolition crew started working shortly after 10 o’clock at night in the rear of the building and continued to work towards the east side of the building. Several neighbors came out to express their unhappiness of the loud equipment that was disrupting their quiet Sunday evening. One neighbor who only lives two houses from the work site was upset because he was trying to sleep when all of the load equipment started to roar. He was surprised that he didn’t receive a letter or anything notifying him that this was going to take place during the evening. He vocally displayed that he was very upset to a police officer assigned to traffic detail and advised him that he would be contacting borough officials in the morning. The crews continued working till sometime in the early morning hours. Crews then worked the next day to separate materials and to remove the debris that was dismantled the evening before. 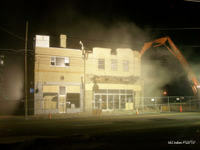 The demolition crew then returned again Monday evening to finish the job. The crew started shortly after 9:30 pm and by ten o’clock there was a crowd that had gathered in their vehicles sur-rounding the Harwan site. The crowd of on-lookers and past movie goers came and went for the next two hours. Several vehicles stayed to watch well into the early hours of the morning. 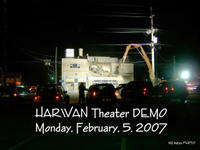 Many of the former Harwan patrons took pic-tures and some even captured video of the buildings final run. The demolition continued throughout the night until all of the remaining structures where lev-eled. 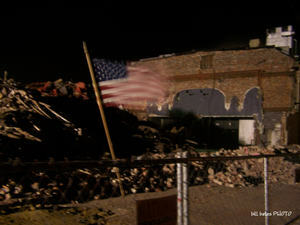 The next day, all that remained was just a large pile or rubble. I personally went to grab several bricks from one of my former teenage hangouts. I lost count years ago of the number of inexpensive movies that I have seen at the older magnificent build-ing with many fine examples of decorative art deco on its exterior. The theatre was built in 1929 and first opened its doors on Thanksgiving Day in 1930. 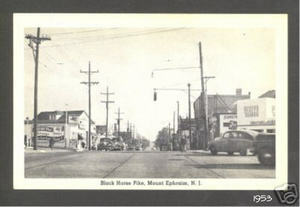 The original owners, Elias and Eva Harwan decided to name it the Mount Ephraim Theatre. It remained that way for years until a young gentleman bought the building in 1968 from the grandchildren of Mr. & Mrs. Harwan. It received a facelift in the early 70’s and over the next 20 years started showing second hand films which many of the locals regularly enjoyed. The 500 and some seat single screen theatre has seen many different venues from live theatre performances to live bands in its recent years. The theatre in its most recent years be-came very popular when it started running “shows” of the famous 1975 film The Rocky Horror Picture Show, which it did for just a little over 10 years. The matinees were shown every Saturday night at midnight and admission was only $5.00. The place was al-ways crowded and filled with energy. The theatre has not regularly shown films since the early 90’s. In just the past three years, the property was leased to a woman who was on a mission to renovate the historic movie house and to bring live theatre back. Unfortunately, the approximate $70,000 that she had put into the theatre wasn’t enough to save the historic site. In 2006, plans were approved by the Mount Ephraim Zoning Board which gave the green light to the Walgreen’s corporate officials. One can only wonder and hope that this new drug-store chain doesn’t end up like the one only a mile down the road in Audubon at the White Horse Pike and Kings Highway. Eckerd Drugs bought the former aged movie house and adjacent costume fabrication store out in 2003 to make way for a new location. This new store didn’t even make it to the one year mark before they had to close their doors. The building has been vacant ever since. Let’s just hope this doesn’t happen to a building that will sit at the main entrance of a revitalization project that will begin this spring to give the main corridor in town a major face-lift, a facelift to the sum of $250,000.